His affinity for helping others inspired him to study medicine. He brings more than 15 years of expertise in the field of Emergency Medicine and looks forward to sharing his skills with the Laredo community at STAT. 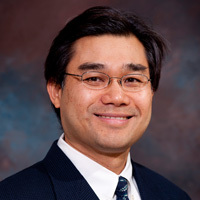 Dr. Vo attended Kent State University in Ohio. Immediately following his graduation in 1992, he was accepted into medical school in Northeastern Ohio University’s College of Medicine and received his M.D. degree in 1996. Dr. Vo then completed his Emergency Residency at William Beaumont Hospital in Royal Oaks, Michigan in 1999. From there, he received an MBA from Rice University to learn more about the business side of medicine in 2004. He is board certified and is a managing partner with many free – standing emergency centers throughout Texas. He and his wife Kim, are the proud parents of four children. Dr. Vo enjoys spending time with his family, likes to participate in physical fitness activities, and plays guitar. He is proud to be a part of STAT and is very happy to meet the medical needs of the Laredo community and the surrounding areas.